In the town where I grew up there used to be a rickety old low level bridge made of big ol' chunks of wood. It would always drown in a passing flood and the planks of wood would jump like piano keys every time a car hurried across it. The low level bridge wasn't far from the farm my folks used to run and somewhere in my draw of photos from childhood there's a photo of it taken on my dad's old Canon camera. When I was contemplating what to call this blog, I passed over a bridge in Byron Bay, NSW, that reminded me of that rickety relic from my childhood. I called this blog Low Level Bridge in honour or that memory and, for more selfish reasons, so that every time I log in to post a story I experience the rush of nostalgia that makes me smile. Thank you for reminding me that I’m failing at parenting. I’m not sure what happened, I just plain forgot to turn on my alarm today – the one that reminds me at least hourly that I could do better, should do better, MUST do better. That I’m spending too little quality time with the most precious and perfect things I’ve ever created and too much time yelling at and bribing them. The Weetbix I forgot to clean off the table this morning before coming to find you that’s now set like concrete. Just between you and me, it’ll probably still be there at dinner time, too (it was). The load of washing that’s sat in the machine for a day now and is likely creating a microbiota all of its own. The laundry that’s been on the line for two days and has nowhere to go because my not one, but TWO, laundry baskets are already full. The food and dirt you would’ve noticed on my kids’ faces at the playground because, God forbid, getting grubby is more fun than looking presentable. The television I caved into when we got home from seeing you without even a skerrick of resistance. The stinky nappy I only discovered after we got home. You wouldn’t know this, but I’ve been so busy failing at parenting that I’m also excelling at failing at marriage too. I genuinely can’t recall the last time my husband and I sat down to relax on the couch together without waking up at midnight in awkward semi-upright positions needing chiropractic intervention. The thing is, I didn’t know my alarm was on the blink until I met you. Because, I thought I was actually doing OK (I know, funny, right!). I’d got three kids under five – including a fairly fresh baby – fed and dressed in clothes that were actually ironed. I got us all out of the house and happily playing outdoors by 9:30am. I had a cooler bag full of healthy food for them and I’d even managed to put on enough make-up to (hopefully) not frighten the other children. So, I feel lucky really. Lucky that there are well-meaning members of the community, like your good self, to remind me just how sub-par my efforts are. For days like today, when I forget. People who have no idea how many hundreds of times I squeeze my kids each day to tell them I love them. People who have no idea how many times I’m up at night calming tearful cries. You looked fresh as a daisy, by the way, sitting on the park bench looking at your phone whilst minding a kid that – judging by your age – you get to give back at the end of your shift. Thank you for being there today. If it hadn’t been for you, I would’ve forgotten to let myself off the hook occasionally. Because there’s always someone well-meaning around to put you right back on it. I usually like to sign off letters with cheers or kind regards or love always, but I feel there’s really only one appropriate valediction here. Emotionally speaking, on the scale of cries at toilet paper commercials to I was born without tear ducts, I comfortably dangle my legs over edge of the toilet paper end of the spectrum and drink in the view. It’s my natural state of readiness, I can’t help it and I can’t say I really want to either. I am just a massive fan of having a big ol’ cry sometimes. I liken it to a thunderous summer storm rolling through town on a hot and humid day – it releases the pressure. Thing is, it’s gotten worse over the years and all I can put it down to is a combination of getting older and having kids. There are many well chronicled injustices that come with getting older, like surplus folds of skin and the constantly expiring warranties of your joints and bodily functions. But, lurking behind these mildly worrisome battle scars, or perhaps because of them, there are a few really great perks. And the best one, by far, has to be being a better friend to yourself. This may not be a feeling shared universally, but you start to feel a little more comfortable in your skin as you get older. Similarly, having kids weakens any stoicism you might’ve once enjoyed because there’s nothing like watching the beauty and innocence of a little person you created living and feeling every moment 100 per cent honestly to make you cherish and fear everything precious. There are some exceptions to this newfound freedom, though, and crying in the middle of Target over a $15 polka dot swimming costume I wasn’t allowed to change for my daughter was one of those times. Not my finest moment. In my defence, I was heavily pregnant at the time, so the kill switch on my waterworks setting was on the blink. Miraculously, as I stormed out of the store, at my glacial pregnancy pace, and wondered aloud why I had angry tears spilling on to my cheeks over something that wasn’t really a big deal, it garnered enough pity from the store manager to follow me and not only let me exchange the cossie, but to also give me a big cuddle. That’s the healing power of letting the tears roll. I highly recommend it, anytime; when you’re at home watching a crappy life insurance commercial while you’re waiting for The Real Houswives of Wherever to start screaming at each other or in a crowded shopping mall slipping on the spilt milk you couldn’t see for the tears. I’m a little worried about evolution. I’m no scientist and my knowledge of Darwinian theory is basic at best, being sourced from the dusty secondary school biology files in my memory’s long-forgotten archives, as it is. For instance, I vaguely recall there being a tale about giraffes’ necks extending over time to take advantage of the more abundant – and less sought after – food provided by acacia trees. Fact or fiction? Who knows, but I bought it. Figured this guy, Charles Darwin, was on to something. And, rightly or wrongly, I’ll probably tell it to my kid next time we’re at the zoo and she casually asks, “so, mum, tell me about Charles Darwin, what’s his schtick?”. She’s only in single digits age-wise and a while away from reaching the minimum height requirement for the teacup ride at Disneyland, so I’ve got some time to polish the giraffe analogy. Lately, though, I’ve been wondering what happens when we dabble too much with Darwin’s thoughts on the order of things; the natural world’s way of weeding its garden. What kind of evolutionary domino effect do we unleash on the world. I wouldn’t say it’s keeping me up at night or sending me rushing off to build an ark – parenthood’s left me too exhausted for that – but it’s definitely making a regular appearance on my roster of things to ponder. The little tweaks that happen to Earth’s creatures over time to give some of us better odds at getting through this thing called life in order to pass on any superior genes to our littluns. For example, people with double-jointed thumbs or a ridiculously acute sense of smell; features that are bound to come in super handy in a few hundred years. Bearing that in mind, there’s one particularly serious purveyor of synthetic evolution that has a lot to answer for – cosmetic surgery. How is evolution meant to get its day job done when there are people running around artificially enhancing their features to be fitter than they were genetically destined to be. How are the legitimately fit (in the survival of the fittest sense, of course) meant to avoid this skulduggery. Then there’s the we know best attitude us humans just love to adopt. For example, there’s the alligator getting CT scans in Miami, USA, for fear he might have melanoma on account of his pale leucistic (looks albino, but isn’t) skin. Then there’s the tiger having corrective eye surgery for her cataracts and another condition that makes her cross-eyed. Lucky I’m not going to be sharing a dinner table with the likes of the amazing Jane Goodall any time soon, isn’t it. My concerns would send her running back to Gombe National Park to be with the smart folk. But, then, we’re all a work in progress, aren’t we. It must be time for James Bond to start needing annual eye tests to have his driver’s licence renewed. That includes being one of the most successful Bonds of all time, with at least two (Skyfall and Spectre) of the top five highest grossing films in the franchise, depending on which online source you consult. By the by, isn’t it comforting knowing even James Bond lies about his age. But, even those with a licence to kill must admit, at some point, that age is sneaking up on them. Actually, I would’ve thought it would make you more sensitive to any dulling of the senses – no one wants to see someone with arthritic knuckles, swollen like beads on an abacus, waving around a Walther PPK. It’s dangerous for everybody. So, why the suspicion over Mr Bond’s driving ability? Quite simply, the man trashes cars the way the rest of us put out the trash – all the damn time, it seems. On a quiet Saturday night recently, I bunkered down with a block of chocolate and hot cuppa, ready to enjoy the weekly screening of Bond offered on rotation by the local TV stations. Within minutes of the title credits of Quantum of Solace wrapping up I was wincing in physical pain at the sight of Bond convincingly destroying his beautiful Aston Martin DBS in a few furious minutes. Honestly, it was heartbreaking. Right up there with when the War Horse got tangled in barbed wire on the Western Front. In his most recent death-defying endeavour, Spectre, Mr Bond is reported to have trashed no less than seven Aston Martins at a cost of around US$37 million. Excuse me for a moment while I dab the tears from my eyes. 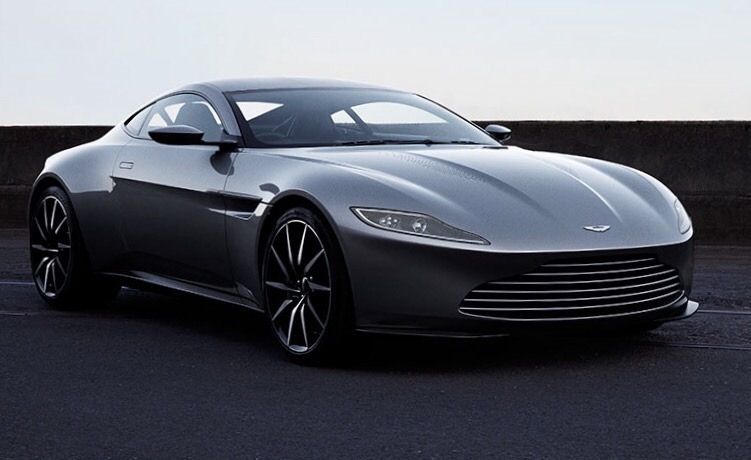 AND, not just any Aston Martin, but a DB10 designed and lovingly built especially for the movie. Surely, Bond’s Chief Gadget Man, Q, has realised by now that his R&D budget would be far better preserved if he just suped up a Skoda in future and let Bond go to town in that? The fine folk at Aston Martin must also be starting to despair at all those wasted hours of painstakingly hand-crafted deliciousness going to waste with barely a growl from a V12 engine. Especially when it takes around 200 hours to build just one Aston Martin in their swanky factory in Gaydon, Warwickshire (UK) – fifty of which are spent on the paint job alone. Yes, I wonder if it’s time Mr Bond considers taking the bus. A commuter train is not the first place I’d choose for a spot of people watching. All those weary worker bees, heads seemingly dipped in prayer, looking at whatever device will take their mind off the stained upholstery they’re sitting on; it rarely makes for an interesting spectator sport. Unless it’s the day your carriage becomes the theatrical equivalent of Willy Wonka’s chocolate factory, and you’re holding a golden ticket. This week, I had VIP seats to some of the most glorious displays of human behaviour I’ve ever seen. Like many people, I suspect (hope), I often make a quick visual sweep of the platform before I board the train, just to get a sense of the characters that are sharing my ride. This day was no different. On my right stood a young girl in jeans and a flannel shirt I’d bet cost a lot of money to look that ‘worn’. On my left stood a man I’d describe as a lot older than me, but only because the birthday alerts keep getting sent to my memory’s junk mail folder; it still thinks I’m in my twenties (bless). Together, we got on the train and sat in the vestibule area by the doors. I didn’t realise my trendy little flannel friend was on the phone until we sat down. She was talking so quietly I doubt an audio engineer skilled at recording praying mantis mating could hear her. But that soon changed. I believe it was her rhythmically aggressive tone and furious gaze that tipped me off to the fracas she was embroiled in. Suddenly it wasn’t just her shirt that was distressed. A quick scan in my peripheral vision confirmed that the commuters on either side of me had twigged to the tiff brewing across from us as well. After a minute or so of different variations of Flannel Girl asking, “why didn’t you answer your phone?”, I couldn’t help but feel deflated at the predictable plot line. But, just as I was about to switch off and join my fellow worker bees at Swipe Club, in swept a whole lotta crazy from the next carriage. A twist so unexpected and dramatic that Flannel Girl suddenly lost the leading role and became a cameo (at best). If I had to guess his stage name, it would have to be Man Under the Influence of Suspicious Substances* Who’s Passionately Interested in the Gaza Strip Conflict. Why? Because in the three loops he did onto the top level of our carriage and back underneath, he was having an enthralling conversation on the phone about that very issue – all punctuated with a series of spectacular lunges reminiscent of the inimitable (until now) Mick Jagger. His performance was electric, I was both spellbound and nervously trying to avoid eye contact. He exited the carriage as flamboyantly as he arrived but the memory of his dramatic exploits stayed with me for the rest of the ride home. Honestly, it’s the only way to travel. *Not something I’d condone or recommend. I fear it’s not safe to visit too long with memories of my life before kids. Mainly, of course, because they bring such incredible joy and, um, yes, deep perspective on what’s important in life. But also because it’s just not helpful to let your mind wistfully wander to weekends spent waking up at one’s leisure and enjoying a peaceful cuppa in bed with the papers. Truth be told, I’ve never done that, but my memories of those days clearly chronicle something like that happening. It’s these very memories, fantasies and half-truths that inspired my husband and I to take a brief sojourn to the Blue Mountains recently without our ridiculously cute, funny, adorable and button-pushing toddler. Just to get some necessary fact to balance out what we were sure was inspired fiction, you see. It’s not like we bolted to the car, arms flailing in the air like lunatics escaping the asylum, locked the doors and rushed off, at speed, before our heaven-sent family members could change their minds. That most definitely did not happen. And, so, it pains me to tell you that any dreams you have that take you tripping, nay, skipping (with daisies in your hair and soft, green grass beneath your feet), to a place where you can visit the WC on your own and leave your house on a whim, are true. You can do everything at your pace – fast, slow or not at all. Naps are for adults, wherever and whenever you fancy. And, the papers can absolutely be read slowly with a cuppa in bed, or during a relaxed breakfast spent in companionable silence. There is a small catch, though – the bone-jarring thud of reality that’s waiting to welcome you back into its clutches. The same reality that insists you check your bright eyes and holiday glow in at the door. The same reality that will make you realise those nostalgic glances at photos of your kids while you were away – usually accompanied with protestations of, “oh, I just miss them so much” – were a misuse of valuable time. Don’t get me wrong, I’ve got a good’un; a kid that’s just so stinking cute I can’t stand it and who makes me smile more than I had in my entire life before she became part of it. But, boy did we pay the price for having a ‘time out’. There was no over-excited, “Mummy!” as she ran into my arms. Quite the opposite, really – more blithe indifference than heartwarming Disney-esque reunion. Then there were the tantrums. Two within half an hour of our return, when I have it on good authority (from my sister-in-law) that she didn’t throw one the whole time we were away. Saving them as a special welcome home gift for us, obviously. See, thud! I blame the hotel. How dare they attend to our every need like that. How dare they lure us into a hypnotic state of restful naps by the pool. How dare they make it possible to enjoy a game of Monopoly without one of the hotels being shoved up a nose or in an ear.